I just got this great shredded memory foam pillow from xtreme comforts. This is the best pillow I have ever used. It is made of shredded memory foam and molds to fit your head. It makes for a custom pillow experience that makes sleeping a peaceful experience rather then tossing and turning. I have a really hard time sleeping at night so I love that this pillow helps me to get some great comfort when I’m sleeping. I wake up every morning feeling refreshed and rested and no more headaches or pains in my neck. 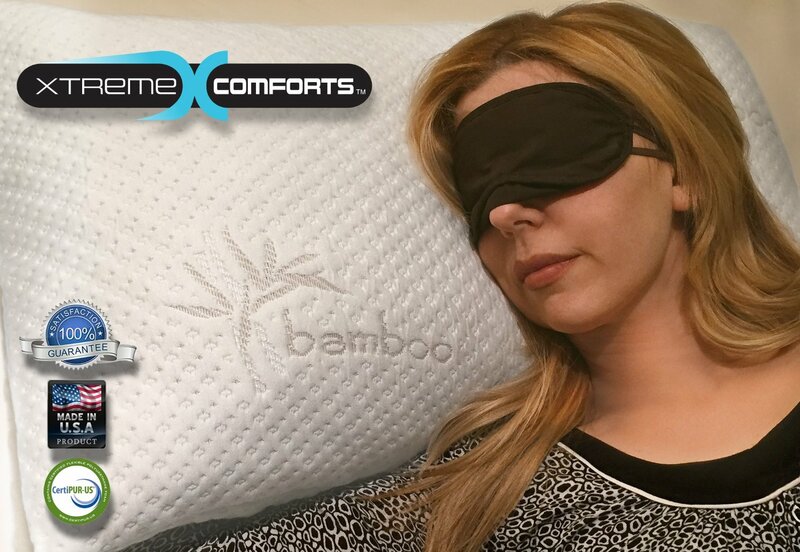 I also love the cool bamboo cover, it keeps your pillow feeling cool throughout the night. It’s soft to the touch and feels amazing. MADE IN THE USA – Our Extra Breathable Micro-Vented Kool-Flow(tm) Technology Cover That Is Combined With 43% Bamboo Keeps You Cool All Night Long For a Deeper Sleep Through the Night! SUPERIOR QUALITY, COMFORT, SUPPORT & DURABILITY – Your Shredded Memory Foam Pillow Will Never Go Flat! You Can Mold Your Pillow So That it is Comfortable For ALL Sleep Positions. Orthopedically Promotes Proper Neck and Back Alignment to Reduce Tossing and Turning For Back, Stomach and Side Sleepers! 100% U.S. MADE WITH CERTIPUR-US CERTIFIED FOAM – Hypoallergenic & Dust Mite Resistant — Great For Allergy Sufferers! Rolled and Vacuum Sealed at the Factory For Frustration Free Eco-Friendly Shipping. PROPRIETARY SHREDDED MEMORY FOAM – Guaranteed to Never go Flat and is Machine Washable! Xtreme Comforts Pillows Are Built For Comfort, Support, and Durability! BACKED BY XTREME COMFORTS – NO Questions Asked Money Back Guarantee. If you aren’t 100% satisfied, simply return it within 30 days! Best it the Business 6 year Warranty! You can purchase this pillow on Amazon!